So what is the subject of this week's obsession. A mixer. Not just any mixer. 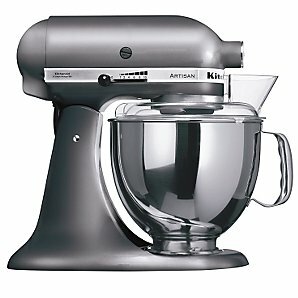 The Kitchen Aid Artisan stand mixer. You know, the one you see on all the cooking programmes- from the Great British Bake Off through Lorraine Pascal to The Fabulous Baker Boys. And I am going to buy one. I am. In Metallic Pearl. I have been waiting since before Christmas with my little pile of JL vouchers. Loving saved from birthdays and christmas'. Waiting to spend. I'm not going to obsess about the free glass bowl offer the wonderful JL had on before christmas.... but they didn't have it in stock. No, now I just want it. I know I should make do with my £4.99 argos hand mixer purchased to keep Toots happy, but I can't. I obviously watch too much TV!!! I could go for a pink one but the other half would kill me. I could go for a red one but it would class with my kitchen. And after all, I have the metallic pearl Kitchen Aid toaster and blender so I really shouldn't go for anything other than metallic pearl. I have a space in my kitchen ready. And a cupboard full of flour, sugar and other goodies for baking madness. I got an email yesterday saying it was in stock. Got very excited, then discovered it was in stock in every colour except the one I wanted. There must have been a run on them as other obsessed wannabe bakers got their hands on them. Damn you all. Just. Need. The. Kitchen. Aid. In. Stock. Now. So. That. I. Can. Obsess. About. Something. Else.